Home The Farms The Route The Package Example Itinerary Prices Terms & Conditions Contact Us FAQs Useful Links Previous Guests Where are we? Bike, hike or on Horse of course! Bring your horse on holiday and enjoy the hospitality of your experienced hosts who have designed all inclusive horse riding holidays for you and your horse. Walkers and cyclists are also very welcome, many of our parties include a mixture of horse riders, mountain bikers and walkers. From your arrival to your departure we provide everything you need including all of your meals and accommodation, along with great stabling or grazing and feed for your horse. 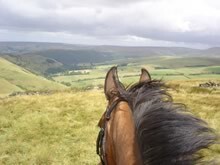 We are two farmhouses situated on the Pennine Bridleway in the stunning Peak District National Park providing outstanding accommodation for you and your horse. Riding holidays are based on a two centre holiday staying at Rushop Hall and Arbor Low, riding between the two farms, and extending your stay with a series of loop rides from each farm. A linear trail riding holiday taking in other overnight stops is also available should you prefer to move on each night. 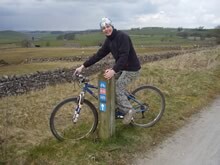 The Pennine Bridleway is well marked and largely off road, offering a variety of horse riding from the gentle rolling landscape of the White Peak through to the more rugged hills of the Dark Peak. 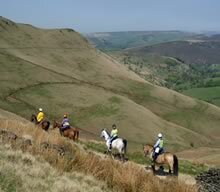 Longer stays are very popular, with fabulous horse riding around each farm. We tailor your holiday to suit your requirements. Just let us know how far you would like to ride each day and for how many days and we will arrange a package specifically for you. To book your horse riding holiday just contact either one of us and we will make all of the arrangements for you.